Addison Moore: Cover reveal of book 3!!!! Wow, that cover is amazing! It's really striking. Beautiful! Looking forward to book 3! I can't wait for the release! Love this series! Stunning cover! I'm getting really excited for book 3! Gorgeous! Just gorgeous! Time to get back to reading Ethereal! (I had to take a break to read a couple of books I promised to review). Alright...I think this might be my favorite one (but it's kind of hard for me to choose between books 2 & 3). You have got some incredible covers! Ralene, Take your time! And thank you! Katherine - I'm having a hard time choosing between the cover's of two and three as well! Erica - Thank you! That means a lot. Love the cover....can't wait for the book. Darcy - Big thank you! Love this series! I'm Team Logan <3, I love Gage though, just not with Skyla...I think he'll be better matcheed with Chloe...hehe. Chubby - I love your comment! And, I cried over Skyla's dad so I get it. Kindlemom - thank you! I really like it, too. Alyssia - Yes, I thought the electric blue really popped, so I was excited when I first saw it. i cant wait for this book. i feel honored to be able to communicate with you. being able to actually talk to and get a reply from one of my favorite authors is unbelievable. i was wondering if there was any way i could get your autograph. i would love an autographed book once they are printed but i would like one either way. what do you think? happytrout - It's my pleasure to reach out to as many readers as I can. I'm stunned to have anyone interested in anything I have to say. As for print books, I'll know more next month when I'll have them available, but right now it's looking like several months because I'm not going through Creatspace. And that is SO cool that you would like me to sign something!! If you want, you can wait until there's a print edition and I'd be more than honored to send you a book plate ( a velum avery label type sticker that you can place inside the cover.) Or if you want a book plate regardless, go ahead and email me an addy where you'd like it sent and I'd be glad to do it either way. My email is addisonmoore writes (@) yahoo(.)com. Or for the less confusing version, just click on my profile. Love it!! Will you be doing any book tours in the near future...?? Addison, LOVE IT!! This just makes me even more excited for book three! It's beautful! Between book 2 and book 3, I'd like them both framed in my house!! When you do get print versions of the books, I would like to know as I want copies of each. For an added bonus, I'd like them signed too! P.S. Can't wait to get more of those gorgeous men! I like them both, but leaning more towards Logan. We'll see how book 3 goes though... I am looking forward to seeing how Marshall plays into book 3! He's an added bonus. Amanda - Aww! That's so sweet about wanting to frame them! I was just telling my husband the same thing! omg theres a book 4?! so excited! Love the cover when do you think it will be available for ebooks? Sharona - Thank you! And for sure within a week or two it will be available for Nook and Kindle. I'll post links on my blog. Sorry for all the blog stalking! haha! I think that's so cool about the cover art being in posters! I want some for my house! Hooray! I know Gage is a crowd pleaser, but there is still hope for us Logan and Marshall fans! (Okay, I'm a fan of Gage too) :) Can't she just have a little of all three...? Make us all happy! I'm WAY looking forward to book 4 now, and I haven't even read book 3! Bring on the chocolate and edits, so we can read book 3!! Amanda - I LOVE your blog stalking! =) And yes, I'm working hard (well not me, my poor husband) on getting the posters. I'm psyched about it! As for book 3 edits the 'final' edits are on track to be finished today! *thank God! * And then its a million look overs- for errors I might have missed, plot holes you could drive a tractor through ;) Not really, I'm just paranoid, plus one more beta has to read it, and I like to read it 'clean' a couple of times myself. As for book 4 my heart thumps wild just thinking about it. Book 3 has its fair share of bombs that go off and I get to play with the fallout in 4. Can't wait! That cover is gorgeous! All of them have been, but this one is especially outstanding! Heather! So nice to see you =) And thanx! Addison, I am really enjoying your series! Every book gets better and I can already see you growing as an author! One day, you're going to give Stephanie Meyers a run for her money! Can't wait to see what's next for you! Congrats! Little Miss Priss - I'm so glad you're enjoying the books! I'm having a blast writing them. It's always nice to know they are appreciated. And wow, your compliment about Stephenie Meyers made me tingle. That's so nice that you would even consider me in the same company. Okay so I am reading that none of these books are even on paper!!!! Your writing is extrodinary. I could not put either of the first two books down. I have even been reading at work (dont tell my boss) I cannot find anywhere a date for the book 3 release and that bums me out!! I know it will be well worth the wait but I almost cannot wait!! You are a beautiful writer and this might just be a series to buy in hardback to put with the only other auther I own (stephanie meyer) yep Skyla Logan and Gage right there with my Bella, Edward, and Jacob.... Thank you for writing and I look for the new book!! Great cover by the way!! HOpefullY you can give an update on the release soon for BURN. I just finished the first two books in 4 days and am DYING for this thrid one to come out! I LOVE them! I'm a teacher of young adults, and just finished your books! In two days! Yup! A WONDERFUL way to start summer vacation!! I am dying for the next one! If the amazing cover is any indication, then I really can't wait!!! Beautiful!! CoryK - Thank you, I'm really happy with the cover too. I hope the book is just as yummy. And thank you for reading the other two, I'm glad that you enjoyed them. I think that's awesome that you are a teacher of teens, I think that would be a fun environment to work in! Chubby - that would be awesome! If you decide to do it I must see facebook pictures. 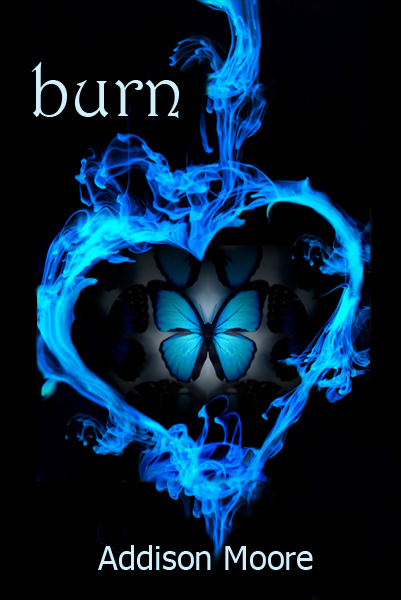 =) And BURN is at the finish line, just waiting for one more beta reader to get back to me. I find it very cool of you to answer all the blog and FB comments. To me, that says alot about you and for that you have a follower in all your writing adventures! Sabrina - I can't wait to get BURN out into the world! I was shooting for midweek but I think I'll need all the way until the weekend. As soon as I launch it I'll announce it, even though it can take up to 24 hours for Amazon to get it up and days for Nook. Got any suggestions? I really do love your books, they're great! I love how it doesn't drag on or get boring, it keeps moving at a good pace and keeps you interested. In fact, it's hard to STOP reading. You had me from page one, and I love that in an author! I've never written a book but I've really been thinking about trying. I'll email you and see if you got any pointers or advice if that's ok. I love the new cover, it's beautiful! Can't wait for the book to come out! You're an amazing author, and I thank you! Kathysuej - I'm so glad you like the books! I'll make sure to put book three out real soon to give you something new to read. ;) In the meantime some of my favorite books are the Book Thief and if your looking for something a little lighter than that, Looking For Alaska is a great read too. And yes, if you have a desire to write, by all means you should do it. I think I'll work on a blog post that explores the basics of writing a novel after I put out BURN. I don't know much, but what I do know, I'd be happy to share. Feel free to email me if you wish, just click on contacts over on the left. Again, thank you for your kind words, Kathy. Not sure if you're still reading comments here, as this was posted a few days ago, but I only just found your blog, so I'm going to go ahead and post anyway. I have read both Celestra books on my Kindle, and I felt compelled to stop by and tell you how much I loved them! I am very much excited about the third! Kind of random but also kind of relevant fact: I just moved to South Korea to teach English three weeks or so ago. I started reading your series before I left, and reading it here has been something fun to do when I start to get a little homesick. Just thought it might be funny to know you've got a reader in East Asia! Amber - Your comment warmed my heart! I'm so glad the Celestra series was able to give you a taste of home while you teach abroad. It sounds like you are on the cusp of an amazing adventure! I think that travel is the most invaluable asset for a writer. Take it all in and absorb whatever you can. I look forward to hearing updates on your travels and your writing. Thanks for reading! I'll be waiting, thanks! I think it's awesome how you interact with your fans. I know you must be very busy, but you always respond to people promptly. I think it's great! THANK YOU! Kathysuej - you're most welcome. And I would love for anyone who wishes to leave a comment on my blog/FB/twitter. I'm so honored to interact with my readers. I am so excited for the release of Burn! My daughter is going to visit her grandparents this weekend so the release date is perfect! Sabrina - I'm glad you saw the comment on the release date and that you'll be enjoying it this weekend! Just FYI, BURN is longer than the other two. So excited I get to download Burn before I leave for vacation! I love your books Addison. Glad to hear I get more Gage, too. Amanda - HUGE thank you for your nice words and for reading!!! I'm hard at work on book 4 now and if I had to guess, I'd say end of August or early September. You can look for updates either here on my blog or over at Goodreads. Hopefully I'll be putting a cover and title in the very near future. Please stop by often! I read all three books in a matter of a few days (and I am a mom of two toddlers and work full time - any free moment I had, I was excited to figure out who she would choose - Logan or Gage, Logan or Gage?? The Sector has never figured in for me!!) :) A few friends at work and myself have an informal book club on our Kindles - and your three books are next on their lists because I wouldn't shut up about them! I hope you are planning a fourth book! Please feel free to stop by often. Have a great one!